Apply caution at intersections: Intersections are high-risk areas for motorcycle accidents. Failure to see a motorcyclist making a turn can be disastrous. Look in all directions before proceeding through any intersection. Check your blind spots: Blind spots are those areas where you cannot see where other vehicles, especially motorcycles, are. Be a safe driver by always looking in all directions before pulling out into traffic, changing lanes or making turns. Keep your vehicle maintained: Almost nothing increases your risks more than operating a poorly maintained vehicle. Lower your chances of causing an accident by keeping it in good working condition. Preventative maintenance also saves money in the long run and optimizes the performance of your vehicle. Avoid lane sharing: Motorcycles naturally take up less lane space than other vehicle types, but this doesn’t matter. Never share a lane with a motorcycle, and be sure to keep an adequate following distance from them as well. Keep your windshield clear: Cracked, streaked, smudged or dirty glass hinders visibility. Always keep your vehicle’s windshield clear. Motorcycles are hard enough to see as it is and combined with poorly maintained glass can be dangerous. Check your windshield wipers: Motorcycles are also hard to see during rainy weather. Be sure to check your windshield wipers on a regular basis and replace them as soon as you notice any signs of wear and tear. Always use turn signals: Turn signals are there to inform other motorists, and motorcyclists, of your driving intentions. Always use them for turns and lane changes. Regularly replace turn signal bulbs for optimal safety. 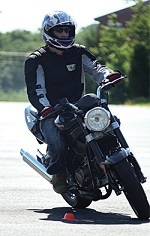 May is Motorcycle Safety Awareness Month, so it’s a good time to remember to keep these safety tips in mind when driving to prevent motorcycle accidents.